Last week, our twin preschoolers turned 4 years old! They had their first birthday party ever, so this is the first year that they received an abundance of gifts. 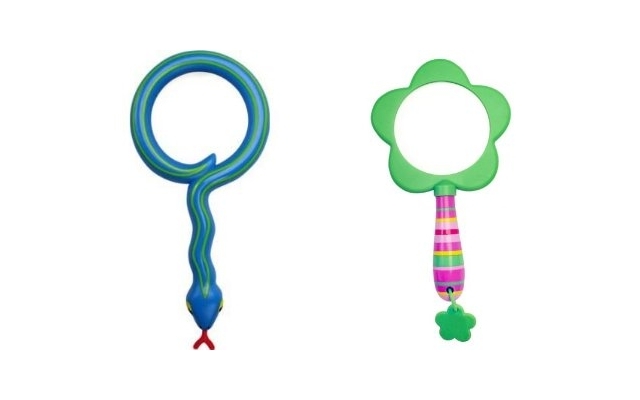 On top of an Automoblox Truck and a Rapunzel Barbie Doll , the twins received the Melissa & Doug Mombo Snake Magnifying Glass and the Melissa & Doug Blossom Bright Magnifying Glass from Todd and myself. I found them for about 75% off on Amazon.com during the holidays and put them aside for their birthdays. I just wanted to share about these jumbo magnifying glasses because, out of all the toys and games the twins received, they were the favorite toys of the day. I think I paid about $6 each for them and they were regularly $19.99 . I cannot tell you how pleased I am about the price I paid for such a positive reaction. It just goes to show that battery-free toys are the way to go sometimes. This article was based on my own personal experience with this product, which was purchased with my own funds. No compensation was received for sharing my experience with our readers.